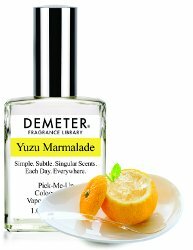 Demeter has launched Yuzu Marmalade, the latest addition to their Fragrance Library. The Scent Yuzu is a unique Asian citrus, with vanilla and apple-like undertones. Demeter's Yuzu scent is in the form of marmalade, so the sweetness of the fruit and sugar or honey are balanced by the sharpness of the Yuzu zest. Demeter Yuzu Marmalade is available in 15, 30 or 120 ml Cologne ($6 - $40). i just had a yuzu pastry the other day (Yuzu Financier, if you are interested). It was delicious. And this sounds good, too. Yum!! And I love Yuzu Marmalade, which I use as marmalade even though I think it is usually used for tea. Yes! My husband and I lived in China for a while and developed a habit of drinking this when we are sick. It is the best! OMG. This could just as easily be a featured Daily Lemming. That said, I have not successfully ordered online because the choices were overwhelming! I had good luck at Marshall’s around the holidays…they had several on offer. Not so many that I was overwhelmed; I sniffed the caps and went home with several of them! I have bought them at Duane Reade as well as at Marshall’s. My issue was the online store had too much from which to choose and my indecisiveness got in the way of triggering a buy. Yay, another yuzu to try, and this one won’t make my credit card cry! ???? This seems really nice! I think I’ll order it. I was also interested in their Orange blossom and Neroli. Have some of you tried them?